Andrew Davis, Executive Director of the Catalonia America Council, former Head of the Delegation of the Government of Catalonia to the United States, Canada and Mexico and Adjunct Professor at the Johns Hopkins University Paul H. Nitze School for Advanced International Studies (SAIS), urge Congress, as it starts its new session, to do so on an international scale and recommit the USA to protecting human rights across the globe, specifically in Catalonia. Why focus on Catalonia, you may ask? He is often presented with the difficult task of trying to contextualize and explain the complex and fast-changing story of Catalonia to our American friends and colleagues. The information making the trans-Atlantic jump to the U.S. is sporadic, which prevents many in the States from understanding the severity of an increasingly worrisome situation, complete with politically-driven arrests, detentions, exile, censorship and hunger strikes. 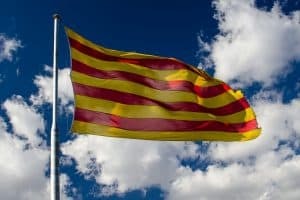 Two mayors from the pro-independence CUP party were arrested on Wednesday morning in the Girona region, in northern Catalonia. The two politicians were later released. In the morning of April 10, 2018, the 35-year-old social worker Tamara Carrasco García is woken by loud knocking on the front door. When she opens, there are a dozen Spanish paramilitary Guardia Civil in camouflage uniforms with machine guns. They have a search warrant against her and a warrant as a suspect of rebellion, sedition and belonging to a terrorist organization. Tamara is not aware of being guilty of anything: “I never risked more than a speeding ticket or an accusation for disobedience,” she says, sitting in a small library in the centre of her home town of Viladecans, a city not far from the Catalan metropolis of Barcelona. Depuis plus d'un an, 16 représentants du monde politique et de la société civile se trouvent injustement en détention provisioire sans procès judiciaire, ou en exil forcé, pour avoir facilité la tenue d'un référendum d'autodétermination demandé par le peuple et approuvé par le Parlement catalan. 4 of these political prisoners went on a hunger strike over two weeks ago. They are on a hunger strike as the only possible way to protest within jail walls, to denounce the violation of human and civil rights in Spain. Do you stand for human rights?